Level 3 (mostly handled by Professional Standards). Members must not perform the role of authoriser in a matter where they are a subject officer or witness officer as this is an insurmountable conflict of interest. An authoriser cannot authorise any matter in which they have acted as an inquirer / investigator as this is an insurmountable conflict of interest. The line manager receives the Provisional Report from the inquirer / investigator. The line manager refers to the Assessment Procedure. The subject officer is then advised of the courses of action that are available to them. The authoriser considers the subject officer’s submission (if applicable). The authoriser writes a Final Report and a Final Determination Notice (if applicable) based on their consideration of the subject officer’s submission. As the authoriser is acting as the Commissioner’s delegate, the authoriser’s decision represents the Commissioner’s decision. As such it cannot be overturned by another senior officer. The only options for review that apply are described in review of decision. The subject officer’s manager delivers the documents to them. Authorisers are members of the rank of inspector or above. 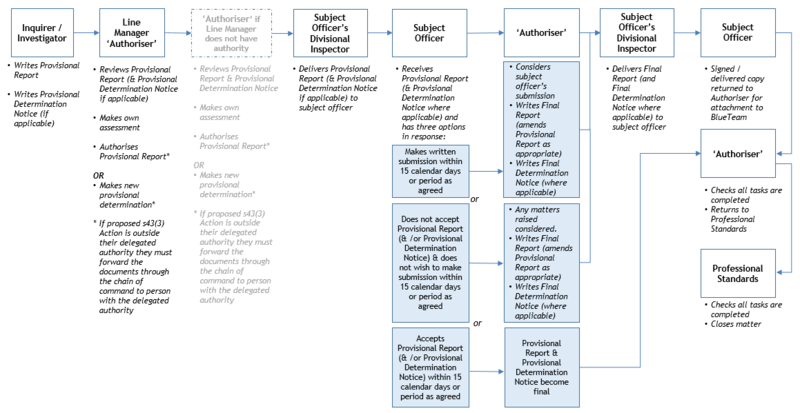 The authoriser is to follow the process described in the flowchart summary and process summary, and Assessment of Provisional Report Procedure. Authorisation is to be made by a member of a rank one level above the inquirer / investigator, if the recommended outcome is within that officer’s delegated authority. If not, authorisation must be made by a member of a rank with the required delegated authority. Authorisers must not authorise a matter where they have performed the role of inquirer / investigator. An authoriser is disqualified from making a decision if “a fair-minded lay observer might reasonably apprehend that that decision-maker might not bring an impartial mind to the resolution of the question that he or she is required to decide”. A lack of impartiality may arise from a conflict of interest or bias (perceived, actual or potential). If an authoriser believes that they are required to disqualify themselves they must inform their manager so that the manager may reallocate the role of authorisation to another member, or take on the authorisation responsibilities themselves. As a matter of procedural fairness the authoriser must make clear that they still maintain an open mind and they have not yet reached a final view. Failure to do this could be considered to be prejudgement or an indication of bias and the authoriser will be required to disqualify themselves from the matter. The Provisional Report template has been drafted to ensure that the subject officer is aware that the authoriser has an open mind (hence the use of the term ‘provisional’ throughout). Authorisers must also consider the application of Continuing Professional Development (CPD) and recommendations to assist Organisational Learning. has not been done but, after considering the explanation provided on the running sheet, the manager believes it should have been done. if not, the assessment of the file is completed. The manager is to consider the provisional finding(s) and the provisional determination(s). then the manager cannot be the ‘authoriser’. They must prepare a Provisional Report Cover Sheet advising of their support for the inquirer / investigator’s Provisional Report – they are not to document their assessment of the evidence and are not to summarise the evidence. They then forward the file through the chain of command to the manager who has the appropriate delegated authority for the proposed section 43(3) Actions. they are to make a new provisional finding and provisional determination only if that determination is within their delegation, and then authorise it by signing in the ‘authoriser’ field on the Provisional Report, and upload the signed report to BlueTeam. and their proposed determination is not within their delegation, then they must forward the file through the chain of command to the manager who has the appropriate delegated authority for the proposed section 43(3) Actions. The file is to be forwarded with a Provisional Report Cover Sheet advising why they do not support the inquirer / investigator’s provisional finding and /or provisional determination. They must state the new provisional findings and / or provisional determination that they feel would be appropriate. They are not to document their assessment of the evidence and are not to summarise the evidence. Once the authoriser has approved the provisional finding and provisional determination, the subject officer is given the Provisional Report by their manager. They are also reminded of the availability of People Support. completing the file closure checklist. The member responsible for delivering the Provisional Report and provisional Determination Notice (where applicable) is typically the subject officer’s manager or supervisor. The documents are to be delivered and explained to the member in person wherever possible. The member delivering the documents is then to complete the page of the Provisional Report titled Provisional Report Provided to Member and request the subject officer to complete the Acknowledgement by Member section. There is no requirement for the subject officer to do so and any signature made is not taken as an admission, but merely as an acknowledgement that they have received the document. The member responsible for delivering the Provisional Report to the subject officer is to draw the subject officer’s attention to the last page of the Provisional Report. This page is titled Response from Member. The member is required to complete this document within 15 days of the Provisional Report being provided to them, unless they have been granted an extension of time by the authoriser. The Response from Member is to be provided direct to the authoriser. Should the member wish to do so, copies may also to be provided their supervisor, manager, and/or commander. Refer to Subject Officer Response. The manager or supervisor is to then load the completed document to the relevant IAPro BlueTeam entry. The subject officer is entitled to a copy. The IAPro BlueTeam entry is then to be directed to the authoriser. Prior to meeting with the subject officer the member delivering the documents should consider whether or not an independent person is required to be present in support of the subject officer. A subject officer is entitled to request that an independent person is present. A Provisional Report is required in matters in which a provisional determination has been made to take action under section 43(3) of the Police Service Act 2003. For complaint based matters, this is a legislated requirement under section 47(3)(b) of the Police Service Act 2003. If it is provisionally determined that the subject officer will receive a Determination Notice, that notice is to be provided to them at the same time as the Provisional Report. It is considered to be a ‘provisional’ Determination Notice – it remains ‘provisional’ unless and until the subject officer accepts it (by signing it or otherwise indicating they accept it) or it becomes the final Determination Notice. accept the contents of the Provisional Report within 15 calendar days (or period as agreed). If the Provisional Report is accepted, the provisional Determination Notice is also accepted, ceases to be a draft and becomes final. The decision is finalised at that time. The timeframe of 15 calendar days may need to be extended in circumstances when a request for disclosure has been made by the subject officer (see below). Tasmania Police will provide access to and copies of (or extracts from) records obtained or created during an Abacus matter upon request from a subject officer who has been the subject of an inquiry / investigation. A subject officer is entitled to seek access to records gathered during an inquiry / investigation. The request to access records may include a request to be provided with a copy of, or extract from, the records. Certain records are subject to automatic disclosure on request (refer 12.6.4). Material that is considered to be exempt pursuant to the provisions of the Right to Information Act 2009 will not be provided. The subject officer will be advised of the reason/s for declining to disclose material that is considered to be exempt. Every effort will be made to ensure that personal identifiers including address, date of birth and contact numbers are not disclosed. A subject officer is not entitled to access any material within an inquiry / investigation file whilst the inquiry / investigation is active. For disclosure purposes inquiries / investigations are considered active until the member receives the Provisional Report or they are advised that no action will be taken. A subject officer’s request for disclosure is to be met within 28 days from the time of receipt of the disclosure request by the relevant commander. In the event that a decision is made to decline to disclose material, in whole or in part, the subject officer may make application under the Right to Information Act 2009 for disclosure of that material. A decision to decline to disclose material is not able to be reviewed under the grievance provisions of the TPM. Access to material is to be requested through the Commander, Professional Standards or through the district commander if the matter is being dealt with in the district. determinations (including provisional determinations) relevant to the requesting member and the reasons for those determinations. Access is to be requested through the office of the commander with responsibility for the inquiry / investigation. The authoriser reads and considers the subject officer’s submission (where applicable). The authoriser then writes a Final Report based on their consideration of the subject officer’s submission. Where applicable the authoriser also prepares a final Determination Notice based on their consideration of the subject officer’s submission. It has the same format as the provisional Determination Notice. The authoriser’s final decision cannot be overruled or overturned by any police officer as they, acting on a delegation from the Commissioner, are making the decision on behalf of the Commissioner. This does not affect the subject officer’s rights of review as described in review of decision. The Final Report (and where applicable, final Determination Notice) is sent to the subject officer’s manager who delivers it to the subject officer in accordance with the process set out at Delivery of Documents to Subject Officer. If the outcome involves a counselling or reprimand by a commander or commissioner, the manager facilitates that action. If CPD is involved that must be arranged to occur promptly, and within the timeframe stipulated in the Determination Notice. Whilst the complainant is to be regularly updated by telephone in accordance with Updating Subject Officers and Complainants, a further requirement to notify applies. For all level 2 or 3 complaint or ED matters, once the subject officer is aware of the final outcome and following the expiration of any review period, the complainant (including an ED complainant) is to be advised in writing of outcome and the determination, if any, to take a section 43(3) action. Advising the complainant of the outcome further supports Tasmania Police being accountable for our actions. Further, we have an obligation, under section 47(3)(a) of the Police Service Act 2003, to inform the complainant if a determination has been made to take any action under section 43(3). Responsibility for writing the letter rests with the authoriser. To promote a consistent approach authorisers are required to use the Notification of Outcome to Complainant template. The letter should provide concise information about the findings and determinations for each individual allegation contained in the complaint, without detailing the course of the entire investigation. Wording of the inquiry / investigation outcome should be accurate and not paraphrased. For example if a determination includes “provision of advice and guidance” then the complainant letter should say “advice and guidance was provided” (and not “internal disciplinary action has been taken”, which has markedly different connotations). There is no legislated obligation to notify witnesses of the complaint outcome however consideration should be given to notifying them, on a case-by-case basis. For example, those who provide significant assistance should have their efforts acknowledged. Whilst members have obligations under the Part 13 of the TPM to report conduct matters involving other members, culturally it is important to foster an environment in which members feel empowered to report such matters. For this reason, when a member reports a matter, the report is to be acknowledged either verbally or in writing. Whilst there is no requirement to formally advise the member of the outcome, consideration should be given to doing this on a case by case basis – with the preferred position being that the member is advised of the outcome. It is not standard practice for Tasmania Police to issue a media release when a subject officer is stood down or suspended. If approached by the media about such a matter, members are to refer the inquiry to the Deputy Commissioner. The Commissioner has authorised Media & Communications Services to prepare and issue a media release when a subject officer is charged with a serious offence or crime, provided there are no legal or operational reasons preventing it. The Deputy Commissioner must authorise each media release. Care must be taken not to identify the member. Their age, gender, rank and geographic location (North, South or North West) and charge are the only details that are to be disclosed. The subject officer’s district, division and station will not be disclosed. A 39 year old female constable from southern Tasmania has today been charged with one count of common assault. The matter is listed in the Hobart Magistrates Court on 1 July. The assault is alleged to have occurred whilst the constable was on-duty in February. The constable has not been suspended but has been assigned non-operational duties. It is not appropriate to make any further comment given the matter is before the court. The media release will be distributed to media outlets and posted on the Tasmania Police website. It will not be posted on the Tasmania Police Facebook page. The subject officer and the Police Association of Tasmania will, where possible, be notified prior to the media release being issued. The Commissioner of Police has authorised Media & Communications Services to prepare and issue a media release when a subject officer is terminated. Care must be taken not to identify the member. Their age, gender, rank and geographic location (North, South or North West) and charge are the only details that are to be disclosed. The subject officer’s district, division and station will not be disclosed. The Commissioner of Police has dismissed a 33 year old male sergeant from Tasmania Police. The sergeant, from northern Tasmania, was dismissed on 13 August after an investigation. The investigation established that the sergeant breached the Police Service Act Code of Conduct on numerous occasions in relation to conflicts of interest and investigative practices. He has not been charged with any offence or crime. During the investigation the sergeant performed non-operational duties and was subsequently suspended from duty on full pay. A copy of the Determination Notice (or the original) must be forwarded to Professional Standards or scanned and uploaded on BlueTeam. A signed copy must also be uploaded by the authoriser to HP Records Manager and saved to the subject officer’s HR folder. If folder permissions prevent the saving of the document in that location then it must be saved instead to the secure folder AD1569. This folder is not available for general access. Records Information Services will then move it to the subject officer’s HR folder on HP Records Manager. If a Determination Notice is overturned on external review, it will be removed from the subject officer’s HR folder on HP Records Manager. At the conclusion of an Abacus matter there is a requirement of authorisers to complete a checklist to ensure that all steps have been completed. Refer to the Process Summary at the start of this chapter for details. Checklists for the various Abacus categories are available on the Word templates here. This page -- https://www.police.tas.gov.au/about-us/abacus/12-authorisation-finalisation/ -- was last published on March 1, 2018 by the Department of Police, Fire and Emergency Management.